Halloween may be a fun-filled holiday for humans, but it can be stressful, and even dangerous, for cats. The following tips will help keep your cats safe and allow you to enjoy the festivities without having to worry about the well-being of your feline family members. Keep decorations and electrical cords and wires out of curious cats’ reach. Cats could ingest strings from decorations, which can cause intestinal blockages, or chew on live wires and get electrocuted. Keep all candy and other Halloween treats away from cats. Cats may be attracted by the shiny wrappers. Ingesting foil or candy wrappers can cause intestinal blockages. While cats are not as sensitive to chocolate as dogs, eating chocolate can cause gastrointestinal upset. Cats tend to like the taste of pumpkin, and may try to nibble at the pumpkins you’ve carved and put out as decorations. While fresh pumpkin is actually good for cats (it can help regulate their digestive system), pumpkin that has been sitting out for days can grow bacteria and mold that can lead to serious intestinal illness. Cats and candles are not a good combination. Curious cats can knock candles over and start a fire. Cats who actually enjoy being dressed up are few and far between. Forcing your cat to wear a Halloween costume causes undue stress. If you must dress up your pet, limit the “costume” to a seasonal collar. All but the most sociable cats will do better if confined to a quiet room if you’re having a Halloween party. Put your cat’s favorite bedding, water, toys and a litter box in a room away from the festivities. Consider playing some soothing music to mute party noise. If you open your door to trick or treaters, make sure your cats are confined to a safe room so they don’t dash out the door. Should the unthinkable happen and your cat slips out, a microchip and collar with an id tag will increase the odds of having your cat returned to you. For many cats, the activity and constant ringing of the doorbell on Halloween night can be very stressful. Consider giving a calming remedy like Rescue Remedy or Spirit Essences Stress Stopper to help reduce stress. If you have a super nervous cat, you may want to talk to your veterinarian about prescribing a tranquilizer. 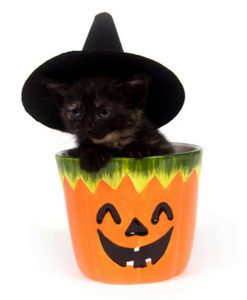 By keeping your cats safe, everyone can enjoy a safe and happy Halloween. Previous PostAlex has a family!Next PostThe Cutie Pies are back!